GR: Here’s a helpful article that explains the drought disaster that is spreading across the southwestern U. S. There’s nothing new here, but the discussion clarifies some issues and will help you prepare for the inevitable changes. The article has an optimistic message, but the science is clear, life will become steadily more difficult in the Southwest, people will move away, and most will be gone from Arizona and large areas of surrounding states by 2100. It is inescapably obvious that we need to redirect the energy devoted to development in the Southwest and the corresponding effort to conserve water to forcing an immediate end to fossil fuel use. 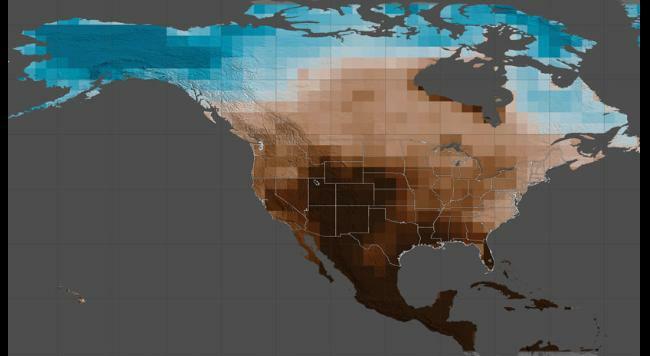 Projected Drought Intensity in the U. S.
Though I believe the future for the Southwest is bleak, there is one small hope that the article contains. The Southwest could become a solar power generator that might give some of the people the financial means to survive the drought. Of course, this does nothing to protect nature and wildlife in the region. I’ve posted 43 discussions of climate-change induced drought in this blog. Click here to scroll through stories about the coming megadrought that can no longer be avoided. “The nation’s two largest reservoirs, Lake Mead on the Arizona/Nevada border and Lake Powell on the Arizona/Utah border, were brim full in the year 2000. Four short years later, they had lost enough water to supply California its legally apportioned share of Colorado River water for more than five years. Now, 17 years later, they still have not recovered. “This ongoing, unprecedented event threatens water supplies to Los Angeles, San Diego, Phoenix, Tucson, Denver, Salt Lake City, Albuquerque and some of the most productive agricultural lands anywhere in the world. It is critical to understand what is causing it so water managers can make realistic water use and conservation plans. “While overuse has played a part, a significant portion of the reservoir decline is due to an ongoing drought, which started in 2000 and has led to substantial reductions in river flows. Most droughts are caused by a lack of precipitation. However, our published research shows that about one-third of the flow decline was likely due to higher temperatures in the Colorado River’s Upper Basin, which result from climate change. “This distinction matters because climate change is causing long-term warming that will continue for centuries. As the current “hot drought” shows, climate change-induced warming has the potential to make all droughts more serious, turning what would have been modest droughts into severe ones, and severe ones into unprecedented ones. The Colorado River is about 1,400 miles long and flows through seven U.S. states and into Mexico. The Upper Colorado River Basin supplies approximately 90 percent of the water for the entire basin. It originates as rain and snow in the Rocky and Wasatch mountains (Courtesy USGS). “In our study, we found the period from 2000 to 2014 is the worst 15-year drought since 1906, when official flow measurements began. During these years, annual flows in the Colorado River averaged 19 percent below the 20th-century average. “During a similar 15-year drought in the 1950s, annual flows declined by 18 percent. But during that drought, the region was drier: rainfall decreased by about 6 percent, compared to 4.5 percent between 2000 and 2014. Why, then, is the recent drought the most severe on record? This entry was posted in Climate Change, Drought, Global Warming and tagged Climate Change, drought, southwest by GarryRogers. Bookmark the permalink.